Leighton Buzzard returned to winning ways with a convincing 23-11 win, based on a fine second half performance against Trowbridge. Having lost five in a row prior to Saturday’s game, Leighton had slumped to ninth in South West 1 East. Leighton had narrowly lost to the visitors in the reverse fixture in Wiltshire earlier in the season, but were hopeful they could end their losing run to the side one place below them. Buzzards won the toss and elected to play against the strong wind. Having failed to deal with the kick off, Leighton were under pressure immediately but slowly began to work their way up field. Initial signs were encouraging - the forwards were out-scrumaging a heavier Trowbridge pack, the lineout was working well and the backs looked sharp. With the strong wind against the home side, every lost ball was kicked deep into Buzzard territory. As a result much of the first half was played in Leighton’s half allowing Trowbridge to take the lead from a penalty after 16 minutes and double their lead to 6-0 after 28 minutes. On a couple of occasions Buzzard breaks were stopped by last ditch tap tackles, but the home side also survived a period of pressure close to their line late in the half,leaving the score 6-0 at half time. Now with the benefit of the wind Buzzards were confident they could control the game – in fact the second half could not have started much better – taking less than 5 minutes to take the lead. A penalty in the first minute allowed Dan David to halve the deficit (6-3) – a further penalty, three minutes later, provided an excellent position for an attacking line- out . While the rolling maul was halted short, the ball was spun out to Jack Whitehouse, playing his last game before leaving for Australia, to make the decisive break to score under the posts. With Dan David’s conversion, Buzzards were ahead 10-6. Shortly afterwards a missed drop goal attempt resulted in a Trowbridge 22-metre drop out. Into the wind it made almost no ground. Skipper Euan Irwin won possession and, sensing the opportunity, the backs quickly transferred the ball to Darren Braybrook who stepped inside his opposite number to score in the corner. With Dan David’s touchline conversion, Buzzards led 17- 6. Whilst Trowbridge stuck to their task in defence, Leighton were now in control. The forwards, secure in the set play, were also dominant in the loose, with the athletic Man of the Match, Wills Messum to the fore. Behind the scrum Dan David’s game management was excellent, constantly pinning the visitors back with well -judged kicks. 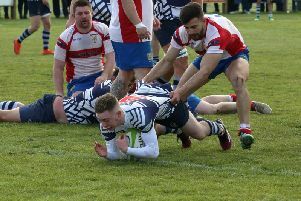 Whilst Buzzards could not secure further tries , penalties in the 25th and 31st minutes allowed fly -half David to add a further six points leaving the final score 23-6. Whilst understandably cautious after recent results, this was a fine performance by Leighton throughout the team. The buoyant mood was further improved when the other league results showed the four teams immediately below them all lost – while Leighton remain ninth they are now 11 points clear of 10th place. With a week off next Saturday, the Buzzards return to league action away at High Wycombe in two weeks.